Description The New Ray Bradbury Review is designed principally to study the impact of Bradbury’s writings on American culture and is the chief publication of The Center for Ray Bradbury Studies—the archive of Bradbury’s writings located at Indiana University-Purdue University, Indianapolis. 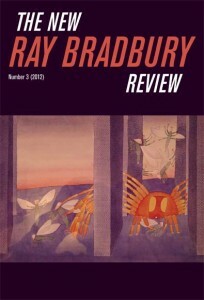 Like its pioneering predecessor, the one- volume review published in 1952 by William F. Nolan, The New Ray Bradbury Review contains articles and reviews about Bradbury but has a much broader scope, including a thematic focus for each issue. While Bradbury’s effect on the genres of fantasy, horror, and science fiction is still being assessed, there is no doubt about his impact, and to judge from the testimony of his admirers, many of them now professional writers themselves, it is clear that he has affected the lives of five generations of readers. In this third number, the Center presents an all-archival issue devoted to Bradbury’s fragments. A prolific writer, Bradbury composed openings for stories that he never finished, together with pages of notes, sketches, and drafts that he kept in suspension for possible use in some form at some place in various narrative projects he was considering, as well as fragments of completed stories that are now lost. These pages are of great interest to anyone drawn to Bradbury’s creative mind, for they reveal his imagination at its most spontaneous. Readers will be excited to discover in this issue Bradbury’s sketches for “The Venusian Chronicles,” revealing a landscape and characters that, while clearly incomplete, carry on the themes of The Martian Chronicles. Included is a checklist of Bradbury’s extensive fragments, compiled by Donn Albright and Jonathan R. Eller. Fans and scholars alike will welcome The New Ray Bradbury Review, as it will add to the understanding of the life and work of this eminent author, whose work has received both a National Book Award and a Pulitzer Prize. Editor William F. Touponce is professor of English and adjunct professor of American Studies in the Institute for American Thought at Indiana University-Purdue University, Indianapolis. He is coauthor, with Jonathan R. Eller, of Ray Bradbury: The Life of Fiction (The Kent State University Press, 2004) and coeditor, also with Jonathan R. Eller, of The Collected Stories of Ray Bradbury: A Critical Edition, Volume 1, 1938–1943. His other publications include Ray Bradbury and the Poetics of Reverie, Frank Herbert, and Isaac Asimov.